We’ve often heard the phrase, ‘Save room for dessert!’ It’s usually used to let others know that if they overeat, they’ll miss out on some delicious sweet treats. But considering how small babies’ tummies are, saving extra room for dessert may not exactly be a practical option. But this doesn’t mean that babies can’t enjoy the sweet stuff – it just needs to be done intelligently! 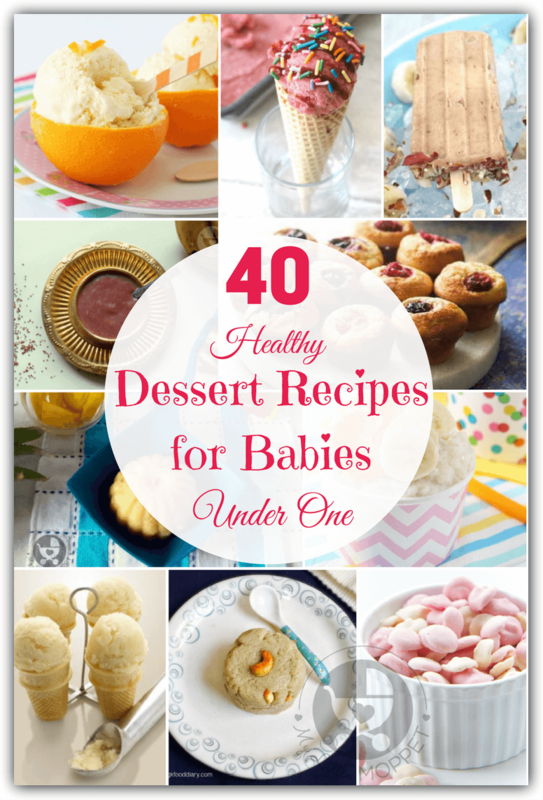 Here are 40 healthy dessert recipes for babies under one year of age – and even for anyone else with a sweet tooth! Well, if it doesn’t have sugar, then it must be perfect for babies under one! This is a delightfully flavored coconut rice pudding from My Fussy Eater, and if your baby is ready for a little change in texture, then this will be your perfect option!  Check out this post about giving your baby coconut. When you want to make pudding and you don’t want to use dairy, what’s the next best option? Avocado! Laurel has a rich pudding recipe that uses banana and dates to sweeten things up, and both avocados and bananas to add the requisite creaminess. Substitute the agave with dates syrup. Eggs are little powerhouses of nutrition and their protein content makes them perfect for growing babies! This egg pudding uses cinnamon and vanilla for flavoring. The recipe also uses whole egg, which is advisable for babies who have already tried egg yolk and have no history of allergies. For more info, check out our post on introducing eggs for babies. Peaches are great for babies, and they also offer a very different kind of flavor. Heinz has a nice peach pudding recipe that uses only three ingredients. You can substitute the canned peaches with fresh fruit instead, to keep the dish wholesome. Here’s a rich, cold dessert for slightly older babies – a chocolate banana custard from Baby Center. Get your doctor’s go-ahead before using the chocolate; else stick to the banana. It’ll still taste great! This is a lovely custard recipe from Baby Center that uses coconut milk in place of milk. The apricot puree adds a nice flavor and steaming it gives it that beautiful texture that your little one will love! This recipe uses a whole egg, so please ensure your baby has had egg yolk without trouble and has no history of allergies. 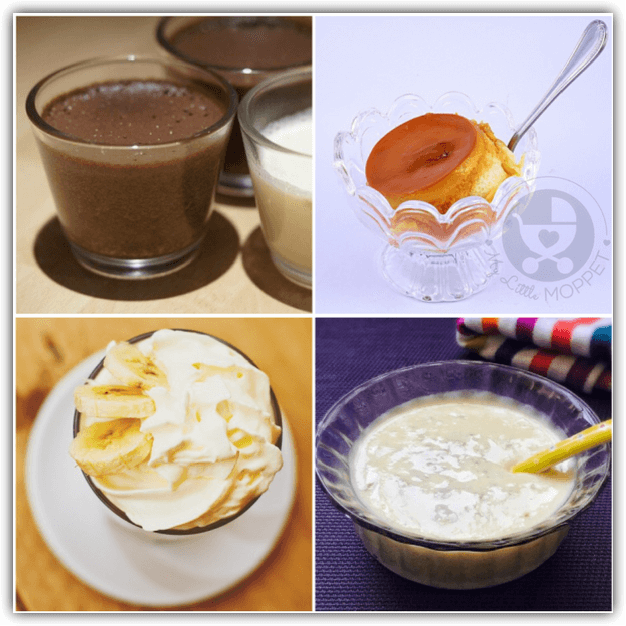 Baby desserts don’t get easier than this instant banana custard from Fatima! Just blend everything and serve! The idea of using boiled brown rice is genius – just make sure it’s well cooked so that it meshes with the other ingredients smoothly. All you need for this easy oats custard recipe from GK Food Diary is already there in your kitchen! Use baby’s usual milk, along with organic oats, egg yolk and dry fruits powder to create a creamy, yummy dessert! Rice is one of the most popular ingredient for preparing kheer, especially for babies. 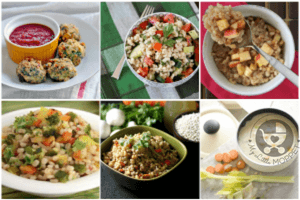 Instead, introduce them to different grains and millets like samai or little millet. Kids generally take to sweet dishes more easily than savory ones, so dessert is a great way to introduce them to our traditional grains! Sooji or Rava is basically semolina, made while grinding wheat into flour. Sooji is easily digestible but filling at the same time. 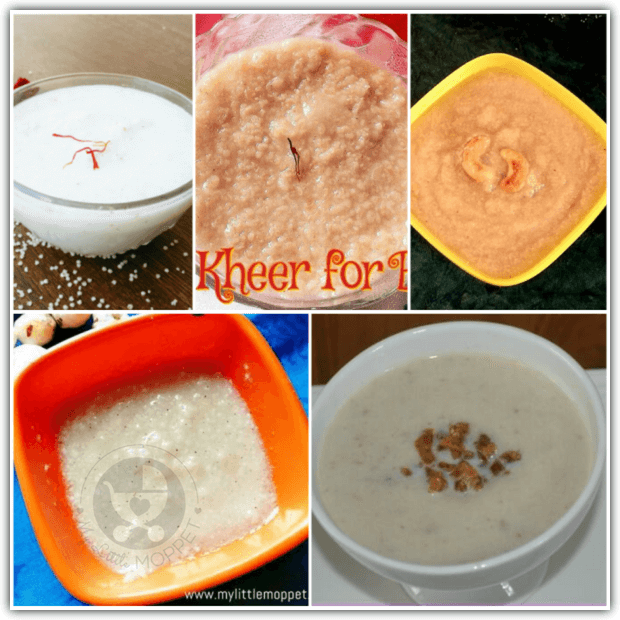 With ghee and dry fruits powder, this Sooji Kheer recipe is the ideal recipe to keep little tummies full for longer! 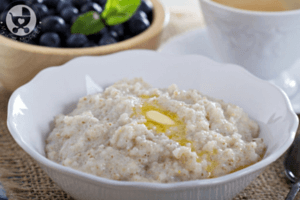 Oats is a nutritious and healthy food, high in soluble fiber and low on sodium. However, not all babies love oats, so this oats kheer makes it a yummy way to sneak in some oats in your little one’s diet! 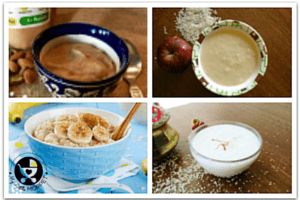 This oats kheer is a healthy and easy dessert recipe and it can be sweetened with dates or fig puree for babies under one. Makhana refers to lotus seeds – not something many Moms are used to! Lotus seeds are rich in carbohydrates and protein, along with magnesium, potassium and phosphorous. The neutral taste of Makhana lends itself perfectly for kheer, to which you can add any of baby’s favorite fruit purees. What’s more, this is an ideal food for travel as only hot water needs to be added to the powder. For many of us, poha is synonymous with breakfast, but it’s quick cooking feature and soft texture makes it perfect for kheer. 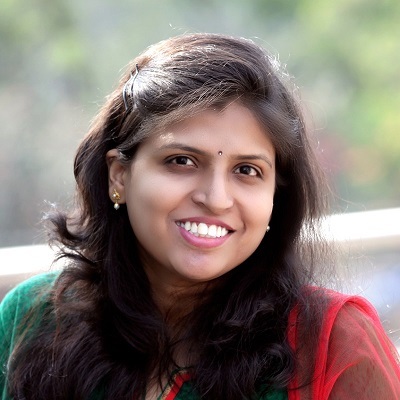 This poha kheer recipe from Shishu World is perfect for weaning babies for a number of reasons – it’s yummy, it’s packed with iron and other nutrients, it’s free from sugar, honey and cow’s milk. Give your baby a naturally sweet nutritious dessert packed with calcium, potassium and fiber – Ragi Banana Halwa! This ragi banana halwa recipe does not make use of milk or sweeteners like jaggery and sugar. 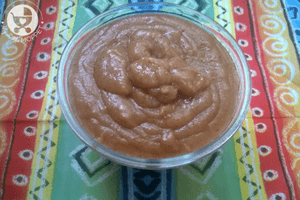 Ripe banana puree acts as a natural sweetener in this recipe. You can adjust the consistency of the halwa as per the baby’s age, making it like porridge or thicker for older babies. If your baby has enjoyed sooji in the sooji kheer recipe above, then take it a step further by adding pineapple! The sweetness of the pineapple and the nuttiness of the dry fruits powder go very well together, so you don’t need any sugar or other sweeteners! Pongal is a popular dish that is cooked specially during the south Indian festival of the same name. It’s a rice dish and mildly spiced, and also has a sweet version – sweet Pongal! 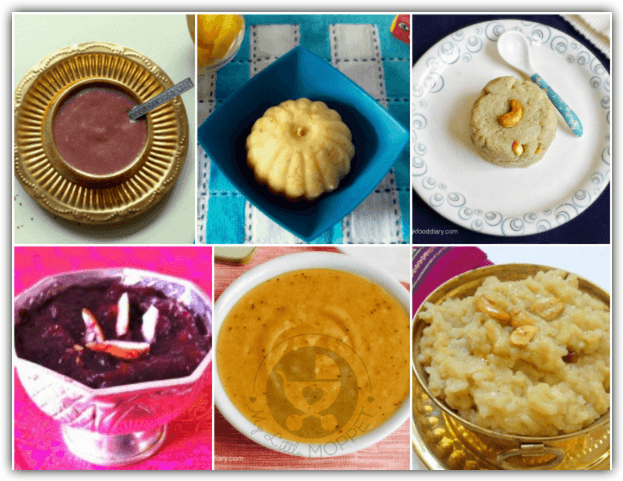 Although sweet, sweet Pongal is much too healthy to qualify as dessert! Besides rice, it also has moong dal and ghee, which are just what growing babies need! When carrot halwa gets too mainstream, what do you do? Make beetroot halwa! Beetroots are an excellent source of folate and manganese, so you have a sweet dish and vegetable dish in one! 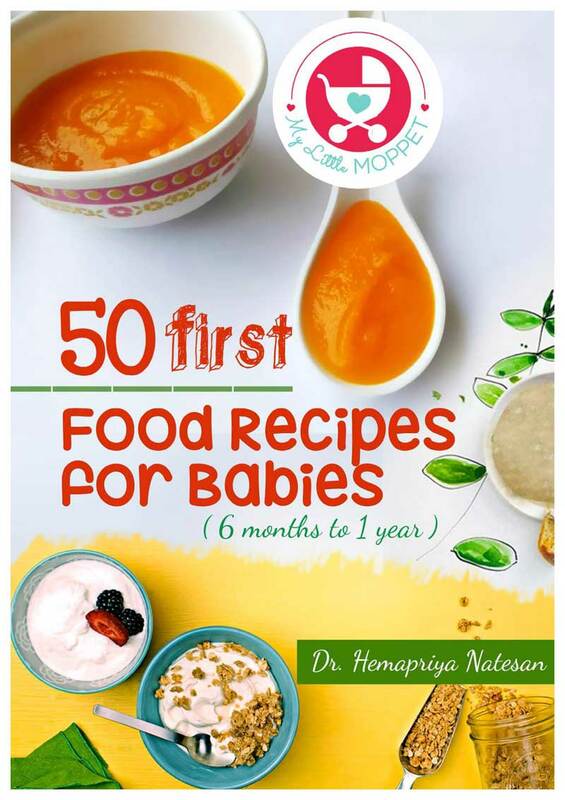 This baby friendly recipe does not use milk, and the beetroot’s natural sweetness does away with the need of sugar or jaggery for babies under one. This is a yummy recipe that works well for babies and toddlers too! GK Food Diary has a simple recipe that you can try. It’s best to avoid the jaggery and cashews for young babies. Opting for homemade ghee will make the dish not just healthier, but tastier too! This wheat halwa recipe is so delicious, you won’t feel like restricting it to babies under one year! From GK Food Diary, this recipe uses dates and apples for sweetness, so you can absolutely stay away from other sweeteners. For older kids (or yourself), you can add in some nuts as well. Wondering how you can make a cake for a baby? I mean after all, you can’t use sugar or butter or milk, so how can it be done? 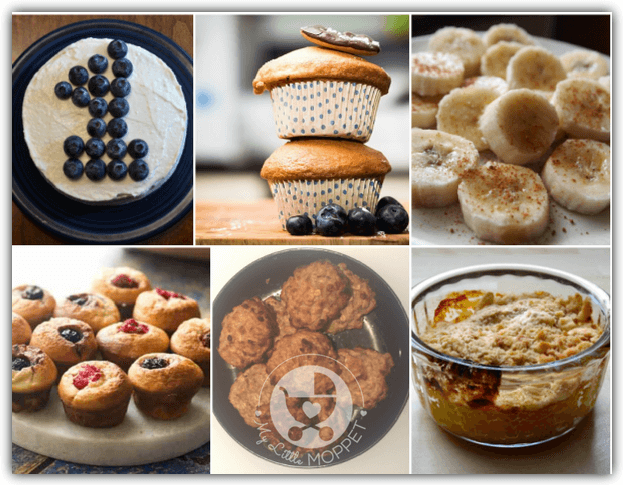 Fit Mama Real Food shows us that it can indeed be done! Using ingredients like bananas, homemade applesauce and coconut oil, the recipe will give you a light cake, perfect for baby to smash! Cupcakes for babies, now how does that work? Don’t worry, Noman has the answer with a yummy mixed fruit cupcake recipe that uses fresh fruits, dry fruits and brown rice flour instead of refined flour. With so many healthy ingredients, this is not a cupcake that will induce guilt after eating! Use mini cupcake moulds to make it easy for baby’s little fingers to handle. Just like the name, baking this dish will fill your home with a blissful aroma! 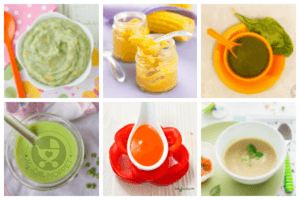 Virginia has a simple recipe that can be modified so that it’s suitable for all stages of weaning as well as for toddlers. You can use date syrup instead of the honey, and puree the bananas for young babies. These mini muffins from Healthy Little Foodies are perfect for little hands to tear apart and stuff in their mouths! 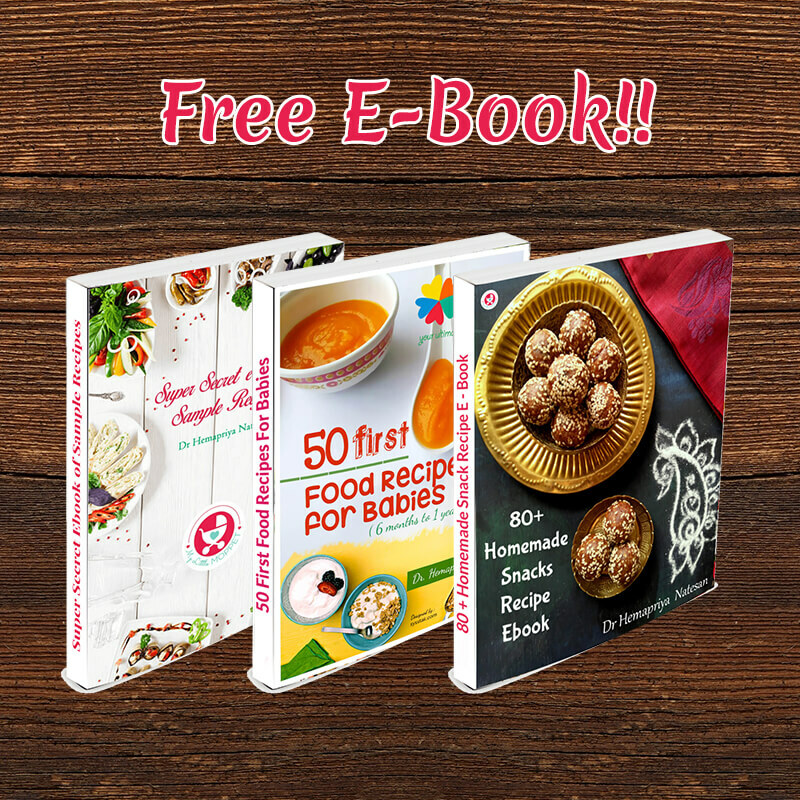 Made with oats and dates, it’s a great option that can be customized for all ages. You can skip the baking powder if you like, but ensure your baby is okay with eating the egg white too. Mummy to Dex has a simple recipe for baby cookies – with just four ingredients! You can use just the egg yolk instead of the whole egg, and you can slightly cook the oats for young babies. And don’t forget, use smooth peanut butter! If you’ve made apple crumble before, before, you know that sugar is an important ingredient, which isn’t good for babies. So Mama Cook has the perfect solution – sugar free apple crumble! Use homemade butter to make this a 100% homemade crumble! You won’t believe how yummy this dessert from My Fussy Eater is! Made from simple ingredients like fresh oranges and full fat yogurt, this is very easy to make, and also deliciously creamy! Perfect dessert for the summer months! As summer arrives and mangoes become abundant, you have got to make this Easy Mango Yogurt Recipe! This is another super healthy dessert that is way better than store-bought yogurts that contain loads of sugar and added flavors. Instead, you get the probiotic goodness of yogurt and the fiber and vitamins of mango in a yummy dish! Cow & Gate has a super easy recipe for pear yogurt that needs just two ingredients – pears and yogurt! Choose a ripe, juicy pear, so that the yogurt is more sweet than tart. If you think it needs a little sweetness, try adding some homemade applesauce. These yogurt melts are so cute! And considering all they contain is fruit puree and plain yogurt, they’re super healthy as well! Use any fruit puree of your choice, though I think strawberry would look the prettiest! These also make great snacks for older kids. 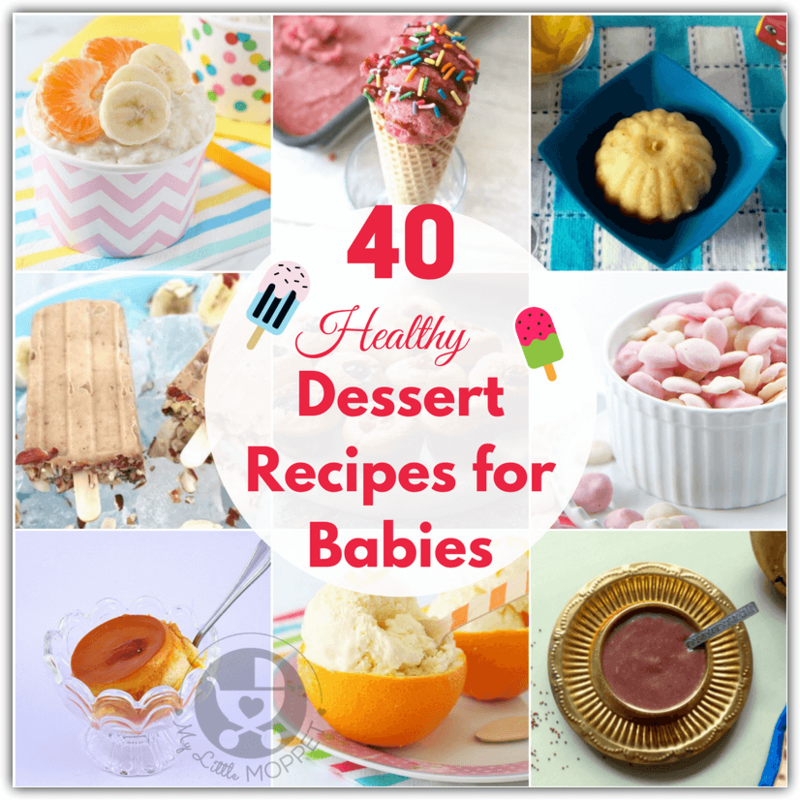 A dessert for babies that’s gluten, dairy and sugar free all at once? Yes, that’s what this strawberry ice cream recipe from My Fussy Eater is – with just two ingredients! Fresh strawberries and ripe bananas are all you need to make this absolutely delightful dessert! 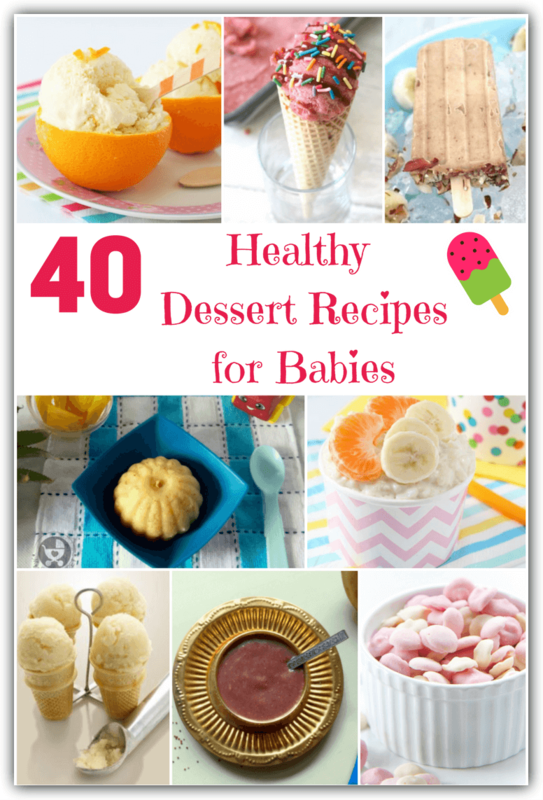 Now here’s the perfect summer treat for baby! 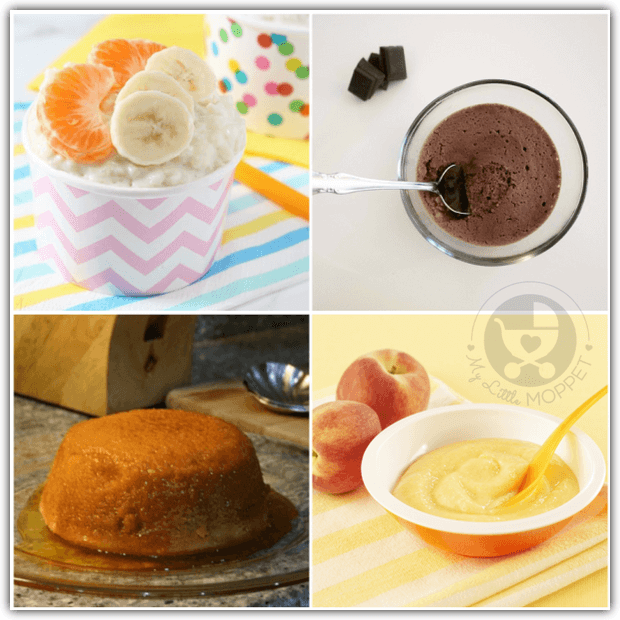 Fit Mommy Diaries shows you how you can make breast milk ice cream where the milk and banana add the required sweetness and cinnamon gives it an extra zing! 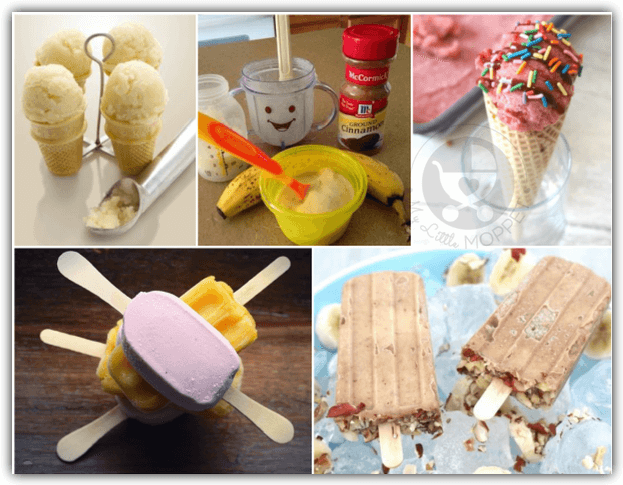 Here’s another interesting recipe from Rohana to make with breast milk or formula – ice lollies! The idea is very basic – Mix the milk and fruit puree and freeze. You can either use a single fruit, if your baby is in Stage 1 weaning, or go with a combination of fruits if your baby is in Stage 2. This recipe from My Fussy Eater sounds like something I would love to try! Peanut butter and bananas are a popular combination, and they come together in this Popsicle recipe. Bananas add sweetness and creaminess, along with smooth peanut butter. Check out our post on giving baby nuts. Sure, the name sounds all fancy, but this is a surprisingly easy dessert to make! This recipe from Annabel Karmel uses fresh apples and pears, so you can skip the sugar – there’s already plenty of fruity sweetness to go around! Besides the freezing time, this takes about 15 minutes, so you don’t have to spend too long! 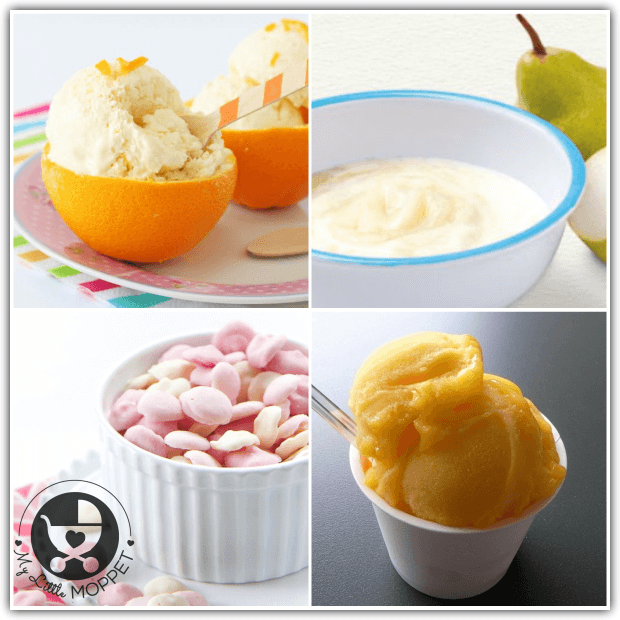 Give your baby a dessert with a slight tang, made of just three ingredients – apple, apricot and water! Baby Center shows us how you can turn simple ingredients into a yummy dessert that’ll have baby asking for more! Shelly has a lovely recipe that is so nutritious, calling it a dessert is underselling it! Packed with antioxidants, healthy fats, Vitamin E, potassium, probiotics and fiber, this avocado cream recipe is many things in one! Make it a little chunky for some texture for older babies and a smoother consistency for the younger ones. This is sure to delight baby – and probably Mom too! 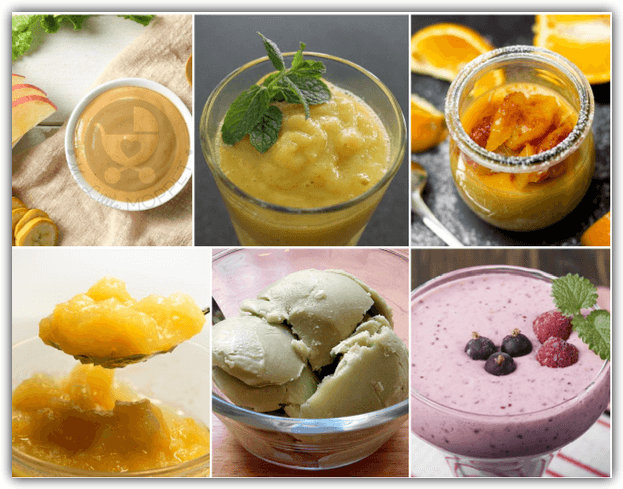 Vickie has a recipe that includes a medley of fruits – banana, mango, apples, oranges and lemons. This is suitable for older babies, once you’ve tried all the fruits individually and your baby has no problem with any of them. You could also modify the recipe by removing the unfamiliar fruit or replacing them with others. If your baby is bored of stewed pear or pear puree, use this nutritious fruit to make a spiced pear dessert from Baby Centre! 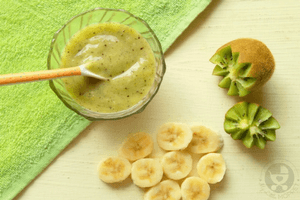 Packed with Vitamins C and B, this is one healthy dessert for your little one! You can substitute the fromage frais with cottage cheese. Check out this post about giving your baby cheese. The best part about Patricia’s creamy fruit cocktail recipe is that you can use any fruit you like – including whatever is baby’s favorite! You don’t have to worry about the creaminess of the fruit, because the cheese and yogurt will take care of it. Go with just one or two fruits to avoid too many flavors clashing with each other. Now this is one antioxidant rich dessert!! The recipe from Mom Junction uses an assortment of berries to make this very attractive dish. You can use the ones mentioned or whatever are available in your area. You can also substitute the maple syrup with homemade date syrup. Now that you’ve got everything you need, go ahead and make your baby something special and sweet! Are you asking for hospital bag items list (delivery)? Regarding the toiletries, we won’t be able to give direct recommendations dear. Please opt for mild organic products. Orange can be given to the baby around 11 to 12 months of age dear. It’s because of it’s acidic nature.